The end of January can only mean one thing, Global Games Jam 2015! My fourth Games Jam, in a row, took me back to Staffordshire University once more. Based on this years theme "What do we do now?" our team of 6 began work on a PC game called White Horse. "White Horse is a turn-based strategy-RPG, set in a post-apocalyptic world ravaged by a vicious disease. Your only goal is to survive for as long as possible - but how you do that is up to you. Will you build a party of adventurers to join you as you crusade your way through the ravaged world or go it alone and kill anyone who shows any sign of infection? Will you run the show as a friendly and thoughtful leader or a ruthless pragmatist? It's entirely up to you. Just be sure you can live with yourself - and the consequences." The below image is the world map from the game. 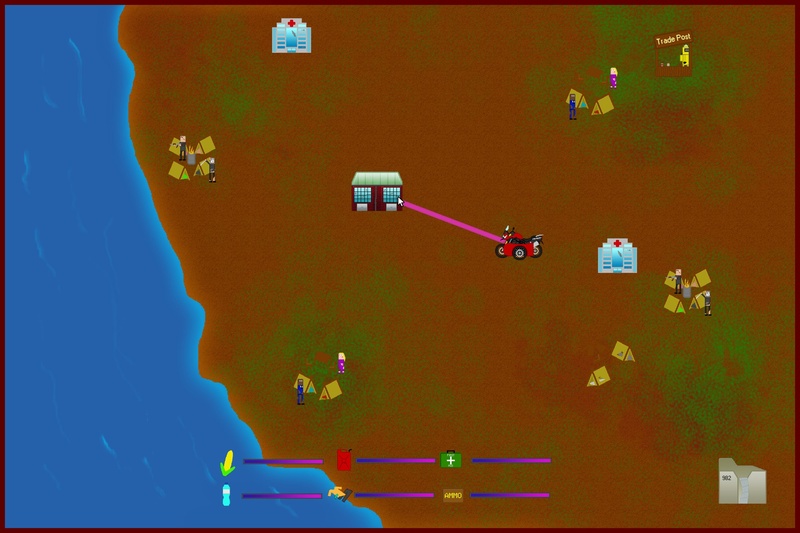 Settlements and their locations are randomly generated, the player must travel between them maintaining their supplies level.